Lily Cole photographed by Flo Kohl. Lily Cole is a true Renaissance woman: a social entrepreneur, actor, writer, philanthropist, filmmaker and environmental advocate, she started her career in fashion. Born in Torquay, England, she was scouted by a model agent while walking through Covent Garden. At 15, she shot her first big editorial - with Steven Meisel for Vogue Italia. 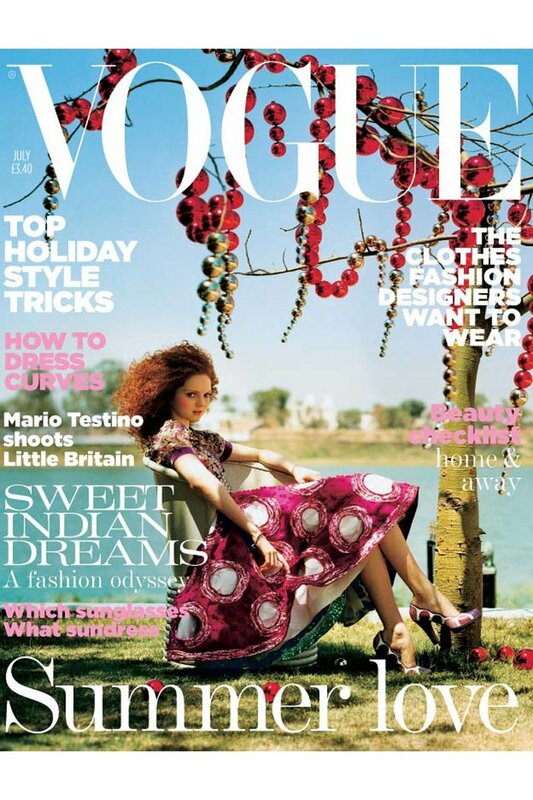 She was the youngest model to appear on the cover of BRITISH VOGUE (see below) and was listed by French Vogue as one of the top 30 models of the 2000s. She worked with all the great photographers, from Meisel to Nick Knight, Arthur Elgort, Paolo Roversi, Emma Summerton and Tim Walker. A favourite of Vivienne Westwood, Lily was a regular on the haute couture runways, walking for the likes of Jean Paul Gaultier and Christian Lacroix. She studied the History of Art at Cambridge University, and in 2013, cofounded social business, Impossible. It began as an altruism-based sharing platform, and has since evolved into a wider technology company that Lily says "is about trying to use tech in a positive way, and doing that through collaborations." Lily doesn't model much anymore, but she still acts. She starred in Terry Gilliam's 2009 film The Imaginarium of Dr Parnassus, cameoed in Star Wars, The Last Jedi. Later this year, she will appear in a film adaptation of the Martin Amis novel London Fields with Amber Heard and Cara Delevingne. Lily is currently producing a film which explores links between the history of the Foundling Hospital, and Emily Bronte’s novel Wuthering Heights. In this Episode, we discuss Lily's love for nature and the ways in which that informs the work she does today. We talk evolution (Lily says of her modelling days, "you're very much carrying the creativity of everyone around you...as a creative person, that was never going to be that fulfilling for me as a job"), revolution (the current capitalist system is failing most people), social justice and campaigning. We talk climate change and the power of positive messaging, and the value and need for business with purpose. Copenhagen Fashion Summit. Lily joined Tim Blanks, Amber Valletta and US Vogue's Tonne Goodman on a panel titled "How Do We Talk About Sustainability Outside of This Room?" Lily wrote the foreword for TAMSIN BLANCHARD'S book is Green is the New Black. Tamsin is brilliant journalist and a friend of Wardrobe Crisis. She works on special projects for Fashion Revolution and curates the Fashion Open Studio initiative designed to shine the spotlight on designers finding better ways of making fashion. IMPOSSIBLE is tech company run by and for "a group of people who have come together to help solve meaningful problems and guide global change." The company "helps to bring new ideas to fruition, with studios in San Francisco, London, Lisbon and Brisbane powering work on client projects with potentially far-reaching impacts...What Impossible offers each is problem solving based on rapid iteration through “loops”, which allow projects to remain on track in achieving their goals." Via Wired magazine. Founded in 2013 by Lily and her partner Kwame Ferreira, it includes a skills sharing platform and aims to be "a community where kindness and creativity are the currency." Impossible is a B Corp. Global warming. Clare's new book, RISE & RESIST, explores the how social and climate justice activism is growing, and intersecting. In 2014, Lily wrote a piece for the Guardian about the Yawanawá people of the Amazon inspired by a report published by the Internal Displacement Monitoring Centre that revealed almost three times as many people are displaced by extreme weather as by fleeing conflict. Working with VIVIENNE WESTWOOD. "For her SS14 Red Label show Vivienne collaborated with Lily to create a film and live performance inspired by the growing number of people losing their homes because of natural disasters. The film is based on the classic Hans Christian Andersen tale of “The Red Shoes” and features Lily dancing in a variety of Westwood pieces (including the beautiful sustainable rubber dress designed specifically for her to wear to the Met Gala)." Via Dazed. Vivienne Westwood and Lily Cole attend the 'A Celebration of the Arts' held at the Royal Academy of Arts, London, 2012. Dr Muhammad Yunus is a banker, economist, and civil society leader who was awarded the NOBEL PEACE PRIZE in 2006 for founding the Grameen Bank and pioneering the concepts of microcredit and microfinance. VOGUE CODES is a summit, interactive seminar and all-round inspiring extravaganza designed to empower future female innovation, and established by VOGUE AUSTRALIA'S content strategy director Zara Wong . At the 2018 event speakers included Instagram's head of fashion partnerships Eva Chen, Canva’s Melanie Perkins and Uber’s Meena Harris. Says Zara: "It's a movement. Not necessarily to convince women to do a career pivot but for them to be aware the understanding technology can influence their creative and entrepreneurial thinking." Lily is working with the Brontë Parsonage Museum in Yorkshire. FOUNDLINGS. ‘Foundling’ is an historic term applied to children, usually babies, that have been abandoned by parents and discovered and cared for by others. Abandoned children were not unusual in the 18th C when the Foundling Hospital was established. Unlike mainland Europe where Catholic-run institutions had been caring for orphans and foundlings from as early as the thirteenth century, the UK relied on the Poor Law to cater for needy families at a parish level. The only charitable establishment that received foundlings as well as orphans was London’s Christ’s Hospital founded in 1552. However, by 1676 illegitimate children were prohibited. By the early 1700s the situation for struggling parents was particularly acute in London. Economic migration from the countryside had led to a population explosion, which put parish-based poor relief under immense strain. Mothers unable to care for their children as a result of poverty or illegitimacy had few options, leading to some abandoning their babies on doorsteps, outside churches and even on rubbish heaps. It is estimated that around a thousand babies a year were abandoned in London alone. This was the situation that confronted Thomas Coram on his return from America in 1704. It took him 17 years of dogged campaigning before he finally received a Royal Charter, enabling him to establish a Foundling Hospital ‘for the care and maintenance of exposed and deserted young children’. Did you know that Heathcliff, the troubled hero of Wuthering Heights, was a foundling? You do now. WIRES GLASSES IS AN INDEPENDENT EYEWEAR BRAND FOUNDED BY YAIR NEUMAN, A LONDON-BASED DESIGNER. WHEN IN NEED OF SOME SUNGLASSES ON HOLIDAY, YAIR DECIDED TO MAKE HIMSELF A PAIR USING MATERIALS HE HAD ON HAND, INCLUDING A SINGLE PIECE OF WIRE. WIRES IS INSPIRED BY BOTH ANCIENT AFRICAN WIRE ARTISTRY AND TECHNOLOGICAL ADVANCEMENTS LIKE 3D PRINTING. YAIR WAS JOINED BY CO-FOUNDERS LILY COLE, MODEL, ACTOR AND ENTREPRENEUR, AND KWAME FERREIRA, SOCIALLY CONSCIOUS ENTREPRENEUR. THE FIRST COLLECTION WAS HANDCRAFTED IN 2017 BY A SMALL TEAM OF EXPERTS IN HARARE, ZIMBABWE.